Tomberlin - Any Other Way. Background - Tomberlin, the rising Louisville, KY-based artist, has released a video for "Any Other Way," the opener from her anticipated Saddle Creek debut album, At Weddings. On her deeply moving debut album At Weddings, Sarah Beth Tomberlin writes with the clarity and wisdom of an artist well beyond her years. Immeasurable space circulates within the album's ten songs, which set Tomberlin's searching voice against lush backdrops of piano and guitar. Like Julien Baker and Sufjan Stevens, she has a knack for transforming the personal into parable. Like Grouper, she has a feel for the transcendent within the ordinary. Born in Jacksonville, Florida, and now based in Louisville, Kentucky, Tomberlin wrote most of At Weddings while living with her family in southern Illinois during her late teens and early twenties. At 16, she finished her homeschooling curriculum and went to college at a private Christian school she describes, only half-jokingly, as a "cult." By 17, she had dropped out of school, returned home, and begun to face a period of difficult transition in her life. The daughter of a Baptist pastor, Tomberlin found herself questioning not only her faith, but her identity, her purpose, and her place in the world. "I was working, going to school, and experiencing heavy isolation," Tomberlin says of the time when she first began writing the songs on At Weddings. "It felt monotonous, like endless nothingness. It was a means to get through to the next step of life." In songwriting, Tomberlin found relief and lucidity she had trouble articulating otherwise. When she was 19, she wrote "Tornado" on her parents' piano, and began to develop confidence in her music. A year later, she had written enough songs to fill an album. Throughout At Weddings, Tomberlin's lyrics yearn for stability and belonging, a near-universal desire among young people learning to define themselves on their own terms for the first time. "I am a tornado with big green eyes and a heartbeat," she sings on "Tornado," her voice stretching to the top of her range. Rich, idiosyncratic imagery - a fly killed with a self-help book, brown paper bags slashed violently open, clouds that weep over a lost love - sidle up to profound realizations about learning to be alive in this world. "To be a woman is to be in pain," Tomberlin notes on "I'm Not Scared." On "A Video Game," she muses, "I wish I was a hero with something beautiful to say." At Weddings is laden with reverence for music itself, for the power it has to heal others and help people navigate their lives. It is a record about learning to love oneself and others without reservation, from a place of deep sincerity - a lifelong challenge whose tribulations Tomberlin articulates beautifully. "My number one goal with my music is for honesty and transparency that helps other people find ways to exist," she says. With At Weddings, this remarkable young songwriter offers up comfort and wonder in equal measure. WEBSITE. Back in June we featured 'Seventeen' describing the song as "a seriously good singer, songwriter track, with gorgeous vocals and a beautifully crafted musical arrangement that adds even more emotion." Now we have a new video for 'Any Other Way' the opening song on 'At Weddings', a beautiful album, as is further evidenced by this adorable piece. If either of these songs have grabbed your attention, I would suggest that making a little time to explore the remaining material, will be both rewarding and delight you even more. Background - UK natives Caezar have announced their much-anticipated debut EP ‘Hail!’ and have just shared their exciting new single with the world, titled ‘Hold On’. The group will be making their release through RG Records and have had the pleasure of having Justin Broad on board as the producer for this latest project, who has produced for names such as Jessie J, Emeli Sandé, Izzy Bizu and Corinne Bailey Rae. ‘Hail!’ also boasts mastering by formidable mastering engineer Stuart Hawkes, who’s work on artists such as Amy Winehouse, Clean Bandit, Rudimental and has been indispensable to pop music the world over. Playing alongside giant names such as Hozier, James Bay and Jack Garrett, Caezar can really hold their own in the scene and have had the pleasure of playing at the award-winning independent Barn on the Farm Festival as well as being featured on the acclaimed radio platform BBC Music Introducing, who have discovered many exceptional UK artists in the pop-rock genre such as Declan McKenna and Catfish and the Bottlemen. Hailing from the unassuming town of Cheltenham, the two founding members of Caezar, Chris Quiqley and Rich Gills decided to take their passion for music to the next level when the pair found themselves both suffering from sports injuries that meant they would no longer be able to play rugby for their local club. It was under the lights of the rugby pitch where the two ex-players decided that they would take their previously hidden musical talents to the stage. When Zoe joined the band in 2017, the trio really found their niche. Her soft synths and sweet-as-honey backing vocals helped build on the unique crossover of pop, indie and rock elements that make up the band’s special sound. Caezar’s single ‘Hold On’ starts off with an infectious guitar lick that sets the mood of the song - pensive but upbeat. 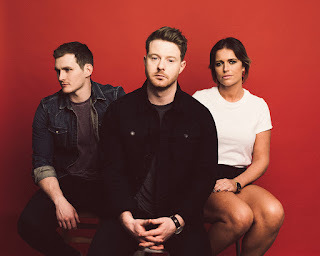 When Chris Quigley’s vocals enter the mix, it’s easy to hear that the group can be likened to modern pop-rock heroes Imagine Dragons and Bastille. The band’s mix of skillfully-played live instruments and expertly produced electronic beats coupled with strong, melodic lead vocals creates an impressively versatile sound. While there is a clear thoughtfulness in the lyricism and delivery of ‘Hold On’, the track still manages to create an uplifting, anthemic mood, with a dash of funk thrown in, much like the work of Will Heard. The track is one that’ll touch the listener on an emotional level while still making sure that the dance floor is packed with bodies moving to the crisp, fun beats. The band explained that, “Just because you love someone, doesn't mean it's right. ‘Hold On’ was written out of the conflicted feelings of breaking up with someone who you still love. The track was one of the first songs the band wrote, and has since come to life after years of performing the track at festivals and finally in the studio with Justin Broad.” WEBSITE. A sophisticated yet understated guitar opening on 'Hold On' is quickly joined by some addictive and captivating vocals and background harmonies. The song is undoubtedly cool and slick, what makes it stand out is the soulful delivery and the seemingly suppressed emotion within the vocals.